Hi there! It’s me again, Jen from Yummy Healthy Easy. I’m back with another yummy recipe for you, this time a summery strawberry smoothie! My oldest son is a huge smoothie fan. Like, HUGE. Now that the weather is heating up, he begs me to make fruit smoothies almost every day when he gets home from school. Not even kidding. I guess it gets him eating fruit, so I’m not complaining! 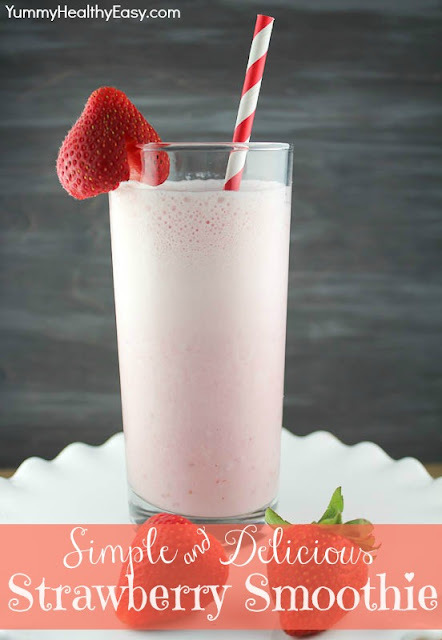 One of our all time favorite smoothies is this basic but super delicious strawberry smoothie. I almost always have the ingredients on hand, so we make it a lot. My son makes it by himself now from memory! It has a yummy frothiness from the milk and yogurt but is fruity and filling. It’s a definite must on a warm summer day! 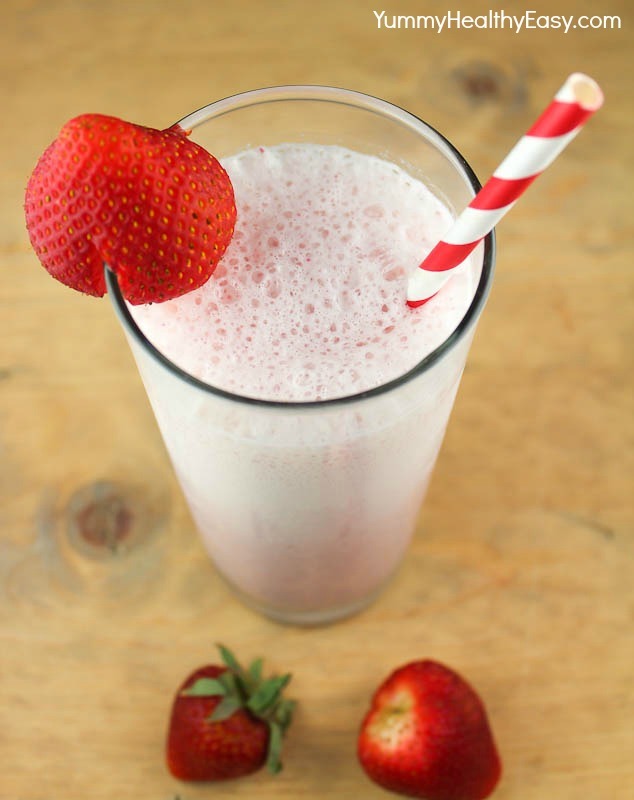 Combine milk and strawberries in a blender and blend until strawberry is finely chopped. Add yogurt, vanilla and sweetener of your choice. Blend until combined. If you like your smoothies a little thicker, add a little ice and blend. I hope you give this smoothie a try, you will love it! Hi! I’m Jen from Yummy Healthy Easy. I’m a recipe addict, cookbook collector, and all-around lover of food! I’m also a mom to four crazy boys. When I’m not carpooling them around to ball games or play dates, you can usually find me in my favorite room in the house – the kitchen – where I love creating yummy, healthy and easy recipes! I hope you’ll stop by and visit me soon! You can also find me on Facebook, Pinterest, Instagram and Twitter! Huge thanks to Jen from Yummy Healthy Easy for sharing this delicious smoothie with us today! I tried one of her green smoothies from her blog this morning for breakfast and it was so yummy! I love all of her recipes! Thanks again Jen! This was delicious! I did add more yogurt to it cause I love yogurt!